What conditions does DDAVP Solution, Non- treat? Desmopressin can rarely cause a low level of sodium in the blood, which can be serious and possibly life-threatening. Drinking too much water or other fluids increases the risk of having a low level of sodium in the blood. Therefore, follow your doctor's directions for limiting fluids. Seek immediate medical attention if you have any of these unlikely but serious symptoms of a low level of sodium in the blood: loss of appetite, severe nausea, vomiting, severe headache, muscle weakness/spasms/cramps, sudden weight gain, unusual tiredness, unusual severe drowsiness, mental/mood changes (such as confusion, hallucinations, irritability), loss of consciousness, seizures, slow/shallow breathing. 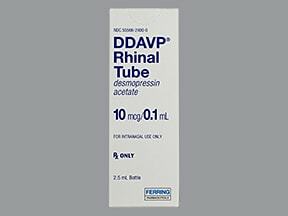 List DDAVP Solution, Non- side effects by likelihood and severity. This medication should not be used if you have certain medical conditions. Before using this medicine, consult your doctor or pharmacist if you have: kidney disease, a low level of sodium in the blood (current or past hyponatremia). Before using this medication, tell your doctor or pharmacist your medical history, especially of: high blood pressure, heart disease (such as blocked blood vessels in the heart), conditions that may increase your risk of fluid/mineral imbalance (such as cystic fibrosis, heart failure), the urge to drink too much water without being thirsty, bleeding/clotting problems. What should I know regarding pregnancy, nursing and administering DDAVP Solution, Non- to children or the elderly? Other medications besides desmopressin may also affect the balance of water and sodium in your body. Therefore, tell your doctor or pharmacist about all the products you take, including: nonsteroidal anti-inflammatory drugs (NSAIDs such as ibuprofen, naproxen), psychiatric medicines (such as chlorpromazine), SSRI antidepressants (such as sertraline), tolvaptan, tricyclic antidepressants (such as amitriptyline), "water pills" (diuretics such as furosemide). Does DDAVP Solution, Non- interact with other medications? If you use 1 dose daily and miss a dose, use it as soon as you remember. If you do not remember until the next day, skip the missed dose and resume your usual dosing schedule. Do not double the dose to catch up. If you use more than 1 dose daily and miss a dose, use it as soon as you remember. If it is near the time of the next dose, skip the missed dose and resume your usual dosing schedule. Do not double the dose to catch up. Do not flush medications down the toilet or pour them into a drain unless instructed to do so. Properly discard this product when it is expired or no longer needed. Consult your pharmacist or local waste disposal company for more details about how to safely discard your product.Information last revised December 2016. Copyright(c) 2016 First Databank, Inc.
Are you taking DDAVP Solution, Non-? Are you considering switching to DDAVP Solution, Non-? How long have you been taking DDAVP Solution, Non-?